The essence of Park, Private Driving and Concours d’Elegance events is to recreate the romance and elegance of bygone days. Drivers may use one or more horses driven in a vehicle suitable for private purposes. It is an opportunity to display the many rare and beautiful vehicles of which members are so proud. NB. Most events of this type today also have classes for business turnouts and vehicles built in more recent times. before setting out on a short drive through the streets or park. Horse/pony must be well-behaved in traffic, walk in the walk section and stand calmly where necessary eg Stop lights, road markings, traffic etc. In the first phase the workout is judged on both reins with the Judge looking for of Position driver, attire and driver’s ability. Presentation of the horse or pony. The second phase is judged during the drive out, and the Judge is looking for: Paces, transitions and obedience.Position of driver, whip and handling of the horse/s. Australia so that potential competitors do not think it is ‘invitation only’. They are aimed at pleasure drivers and period turnout drivers. The classes below have evolved to cater for most members of harness clubs. 4. 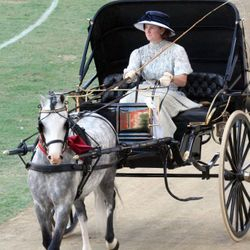 Jogger Turnout – period style or traditional turnout Vehicle - pneumatic tyred, two-wheeled Viceroys are not suitable vehicles for Private Drives so are not included. Multiples (pairs, tandems, teams) are eligible in any of the classes alongside singles. Horses and ponies compete in the same classes together and times on the drive would need to be adjusted to suit different heights. As above in whatever category is deemed appropriate by the organisers. On the move The Judge sits where all competitors will pass at least once – preferably about half way through the drive. At the finish Judging should be done as soon as the horse crosses the finish line. a park or vineyard, in front of a gracious home, on a racecourse or in an indoor or outdoor arena. Evening events are also popular, especially when lamps are lit. The following three classes generally form the basis of a Concours d’Elegance program, but organisers are free to vary (and add) classes according to local conditions. 2. 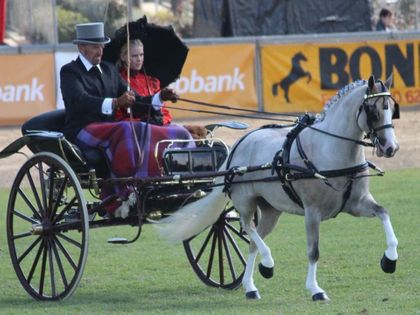 Period style / traditional turnout – reproduction carriages with wooden or steel wheels, leather or synthetic harness. * Each class is open to singles and multiples. * Two judges are preferable to one. * Competent stewards are needed to check that the competitors are in the correct class (eg check for steel wheels, synthetic harness etc) before they come before the judge/s. * It is important to make the judge/s aware that a Concours d’Elegance Event is not judged as a show or turnout class in the accepted sense. It is more a parade of beautifully presented turnouts, with the awards going to the most elegant and appealing. The judge/s should be looking at the overall picture, rather than fine detail. 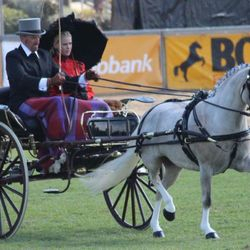 * Competitors should be expected to complete a drive of some distance eg 1 – 5km in the event, with both walk and trot sections eg a drive through a park, a vineyard, quiet streets, around a racetrack or showground arena. They should commence their drives at least 3- 5 minute intervals. * Judging should be done ‘on the move’ and the judges positioned separately where they can observe the on the move both at the trot and walk. on a large circle. This gives the judges an opportunity to make their final decisions. * Presentation of Awards: After all the classes are completed, turnouts assemble in a picturesque spot for the announcement of awards and presentation of sashes and prizes to the winners and placegetters. All other competitors should also receive sashes for their participation. A parade with sashes on should then take place in front of spectators.